Gartner has named INFINIDAT a “Visionary” in its 2016 Magic Quadrant for General-Purpose Disk Arrays1 for the second year in a row. It’s no wonder really when you consider the company was founded by Moshe Yanai, a visionary leader in his own right, who is often referred to as “The Godfather of Storage.” Add the provenance of our team, and over 120 patents filed (60 granted to date) and we believe it’s clear INFINIDAT is revolutionizing the traditional storage array and storage practitioners are taking notice. Gartner’s Magic Quadrant is a long-standing, trusted industry report that helps IT Leader and CIO’s validate their purchasing decisions. We are incredibly thrilled to be named a visionary for the second time considering it’s only our second year since coming out of stealth mode — it feels good to be two for two. Since INFINIDAT’s inception we have shipped ½ Exabyte of capacity around the globe and are continuing to build momentum by beating incumbent storage solutions every day. In a lot of cases, we’ve helped customers consolidate from as many as ten incumbent systems to just one InfiniBox. Over the course of the last few years, IT has heard a great deal about the “All-Flash” array or the “All-Flash” data center. The C-suite has heard from a number of incumbent vendor executives that “All-Flash” is the future, however in the trenches, where it counts, it is very far from becoming a reality. The overall capacity that would need to be stored on flash is not that high today and in a lot of cases, doesn’t require an All-Flash system. The costs to buy the amount of capacity to support this is not a smart business decision. INFINIDAT delivers its visionary innovations in InfiniBox, an enterprise-proven, flash-optimized, storage solution that is 100% software running on top of off-the-shelf hardware and has 99.99999% availability. InfiniBox delivers faster than flash performance with real-world workloads, but with storage economics that provide a TCO that is a fraction of the competition’s. INFINIDAT’s innovative software architecture enables clients to consolidate as many as ten systems to one InfiniBox. When running at peak load, it only uses 8kW of power, allowing organizations to save on power, cooling and floor space. The InfiniBox also simplifies much of the storage administration and management, enabling our clients to manage as much as 10PB of capacity with just one storage administrator. Datacenters today are constantly struggling with the growth of data, how to best exploit their data, and how to protect their data. Today, there is a good probability that the price of the goods and services that you buy from a vendor is dominated by the costs of storage that company consumes to help produce and deliver that item to you. The biggest challenge that organizations have today is figure out how to store, utilize and protect all the data they need to run their businesses without hindering their competitive advantage. Organizations want to focus on their primary skill sets, what makes them who they are in the markets, and their products and services. They don’t have the time or the budget to deal with trying to constantly solve the data storage conundrum. This is where a visionary approach to solving storage problems comes into play. INFINIDAT set out specifically to enable organizations to focus on what they do best and not worry about the typical trade-offs IT has to make when selecting a storage solution. With INFINIDAT, organizations can have it all — no need to sacrifice performance, reliability, scale, ease of use, or flexibility. INFINIDAT provides all of this at a TCO that is unmatched by the competition. And don’t just take our word for it check us out. 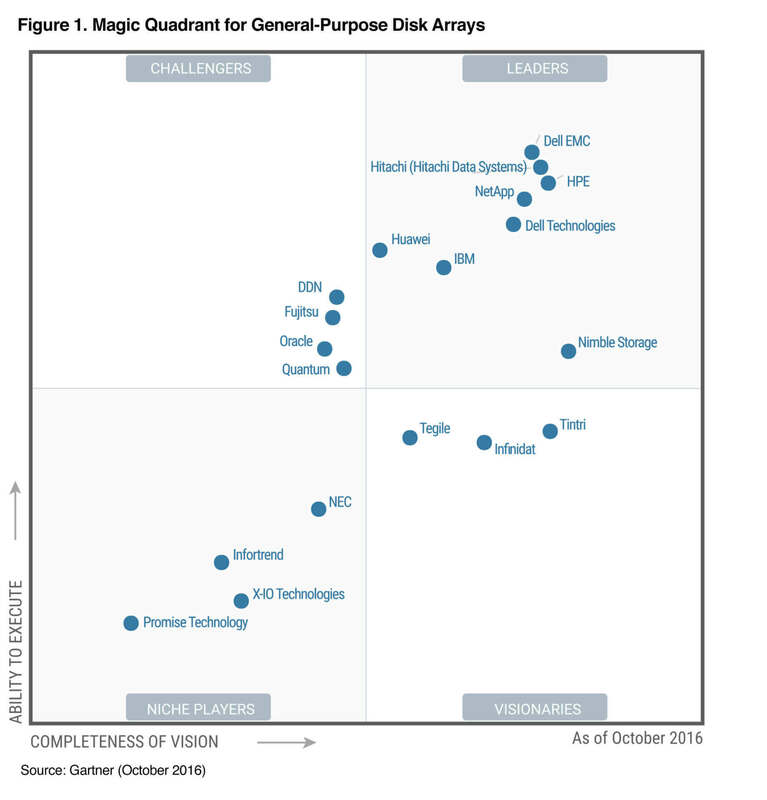 1Gartner “Magic Quadrant for General-Purpose Disk Arrays” by Stanley Zaffos, Roger W. Cox, Valdis Filks, and Santhosh Rao, October 31, 2016. 2This graphic was published by Gartner, Inc. as part of a larger research document and should be evaluated in the context of the entire document. The Gartner document is available upon request from http://info.infinidat.com/gartner_magic_quadrant_report.html?source=Web.